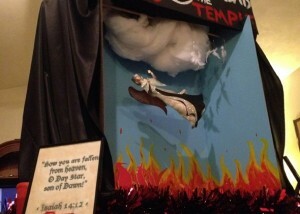 After being denied last year, the Satanic Temple this week received permission to erect a holiday display in the rotunda of the Florida State Capitol alongside other religious displays. The scene depicting an angel falling from heaven is exactly the same as the one that state officials last year called “grossly offensive for the holidays,” but apparently the threat of a lawsuit was enough to remind them that religious freedom applies to all Americans. The Florida Department of Management Services’ decision to allow the display does not affect the Satanic Temple’s ongoing effort to distribute a coloring book in Orange County schools, where the school district has allowed distribution of other religious materials. The school board there is expected to deal with that issue in January, possibly with a policy change which would halt such distributions altogether. According to the New Times of Broward-Palm Beach, last year the Satanic Temple’s application for display space was initially approved but later revoked. Other non-mainstream traditions were allowed, including Festivus and Pastafarianism. The Department of Management Services was uncommunicative after revoking the Temple’s permission last year, so this year the group came with the backing of lawyers from Americans United for Separation of Church and State. Although we are pleased that the state has finally agreed to allow the Satanic Temple’s display, our clients should not have been forced to find legal counsel and plan a lawsuit just to get access to an open forum. The state can’t give itself the authority to decide whether certain religious messages are ‘offensive’ – it needs to allow everyone’s speech or no one’s speech. The Satanic Temple has also been fighting to place a monument on the grounds of the Oklahoma State Capitol, but the status of that project is unknown since the local citizens who signed the application reportedly backed out last week.